Your site displays a 404 or Not Found error message when the server is unable to locate a page, usually due to a dead link or incorrect URL. Creating a custom 404 page is a great way to let your visitors know what went wrong while retaining the unique style of your site. Note: Redirecting to a 404 error page doesn't change the URL in the browser address bar. Il tuo sito è impostato automaticamente per utilizzare la pagina di errore 404 predefinita, che puoi vedere nelle tue impostazioni di design. Nel Menu Home, clicca su Design, quindi su Non trovata / Pagina 404. Puoi anche premere il pulsante ? mentre il riquadro è aperto e cercare i domini. This default page lets visitors know why the content may not be appearing. It includes links to your site's homepage and search page to help them find the content they're looking for. You can create a new page with a customized message for your visitors that matches the unique style of the rest of your site. Create a new page and place it in the Not Linked section. Add your custom text and, if you like, an image. 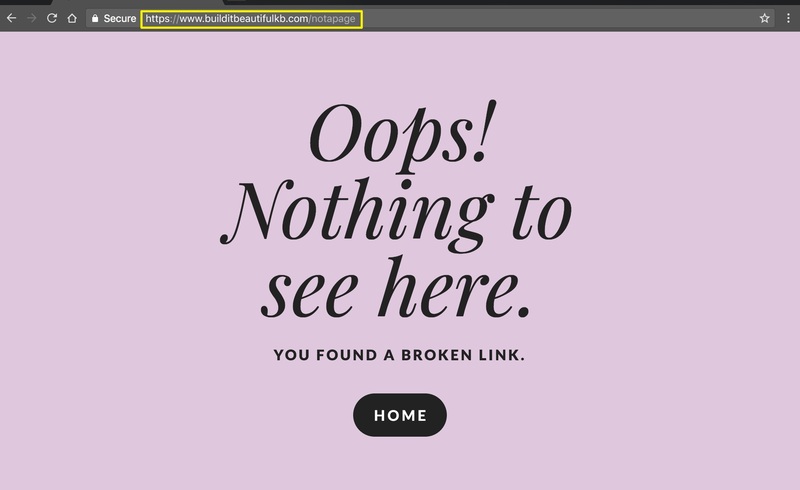 Tip: Use a Cover Page to make a creative 404 error page with full-bleed images, video backgrounds, bold headlines, or buttons directing visitors back to your homepage. Torna al riquadro Non trovata /Pagina 404 . Clicca sul menu a discesa e seleziona il titolo della pagina di errore 404 personalizzata. When someone visits a URL that the server can’t locate, they’ll now be redirected to the custom page. If you build a custom 404 page, you might see a "Soft 404" alert when you verify your site with Google Search console. This doesn't mean there's an issue with your site or its visibility to search engines. Google flags these pages because they see a contradiction: an indexable page that says it doesn't exist. You can read more about the issue in Google's documentation. 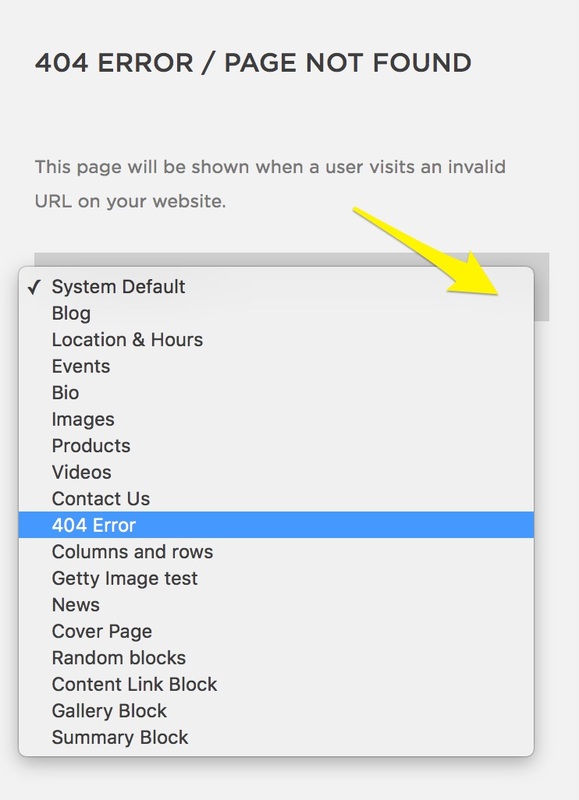 To remove the alert, you can use the default 404 page, or you can use no-index tags to hide the custom 404 page from search engines. What information should I have on my 404 error page? You may want to let visitors know that the page they're looking for can't be found, so they're not confused by the error they see. You may also want to give them a link to the homepage, or the option to search for what they're looking for, like on the default 404 page. What pages can I use for a 404 error page? You can use almost any page type for a 404 error. However, since visitors will be redirected to this page automatically, we recommend using a custom page that explains the error to avoid confusion. Cover Page - Pick an impactful layout and customize the buttons, text, and background. Pagina di layout - Crea layout più complessi con molti tipi di contenuti. Folders and Index Pages can't be used as a 404 error page. What should my 404 error page look like? The sky's the limit. Just like any page of your website, feel free to customize it to reflect the style and personality of your site as a whole. Get creative and have fun!